As we move on to the post eclipse week we thought we thought it would be fitting to give an updated report on what milestones we have met and what lie ahead. Following on from the successful listing of our LED lit door handles and wall sconces we have completed our initial UL inspection and so designers may be assured that the our UL approved fixtures will bare an indelible UL label. To help designers understand our LED single color and color changing fixtures we have developed a series of helpful installation diagrams as well as charts that will help explain what accessories will work best with our products to view these please download our pdf for Coral or our Illuminated products. While the LED lighting scene constantly evolves with smaller brighter and more energy efficient units our focus is on designing and making decorative fixtures that work with this new technology. Our fixtures are hard wired and illuminated either by a small spot or by a strip of LED chips. 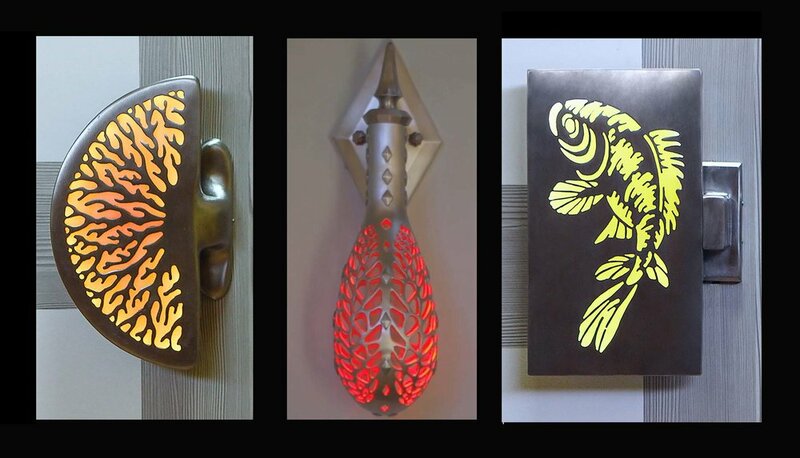 The type of LED impacts our design, as spots are better suited to our round, down lit sconces and cylinders, while the linear strip inside the perimeter of our door panels project a forward directional light that we use to create our fish and coral shapes. The next piece in development for our panel series is a tiger design which will soon be released. The panel concept is also being extended to include a longer rectangular 26" x 4" panel and the first piece will be from our Willow designs.